Posted by Kaitlyn Dormer on 9:00 AM on November 20, 2014 . On Saturday, November 15, over 75 people joined Habitat homebuyer Mai Kee Lee on Morgan Avenue in North Minneapolis to celebrate the dedication of The House that Love Built. The home was filled with energy radiating from Mai Kee, her five young children, and dozens of enthusiastic members of the sponsoring First Universalist Congregation. 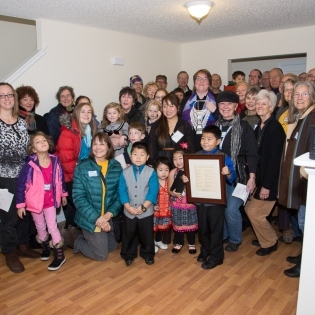 The dedication recognized the homebuyer’s hard work, the tremendous fundraising feat achieved by First Universalist, and the contributions of other sponsors, volunteers, and the community. Tom Saterstrom spoke proudly on behalf of First Universalist, describing Reverend Jen Crow’s “light bulb idea” last October to challenge her members to do something bold: give half of their normal holiday budget to help the church sponsor a Twin Cities Habitat for Humanity home. With an ambitious goal of $60,000, the church rallied its members and revealed the congregation’s tremendous generosity by raising $115,916.66 to sponsor The House that Love Built! Tom described that his church’s social justice initiatives were first designed to welcome immigrants and help them get settled; with this project, the congregation’s history was repeating itself in a good way. Tom shared a story with the group when the children first saw the house during construction. “They had smiles from ear to ear deciding bedrooms and looking at the view. They had joy in their bodies.” The congregation was extremely excited to see the house from foundation to dedication and to attach faces of a family to this house and know that it would be their home. The snowy Saturday was filled with warmth as the crowd learned about Mai Kee’s journey to homeownership, heard from the numerous groups engaged in the home’s construction, and helped welcome the family to the community. Through her excitement and nerves, Mai Kee spoke beautifully about her experiences with Habitat. She described the hard work required to build a house and was thankful to the many people who helped her along the way. She explained that she is looking forward to making decisions about her home and being her own “big boss” in the house. “My hope is to grow old in this house and make a lot of memories,” she said as she explained that this dedication is the first of many good things to come. We also heard from representatives of two community organizations: Fran Heitzman, Founder of Bridging, and Cathy Spann, Executive Director of the Jordan Area Community Council (JACC). Fran promised Mai Kee that they would work together to make the house a nice home with quality furniture and household goods. Cathy welcomed the family to the Jordan area and expressed her enthusiasm for Habitat’s work in the neighborhood. 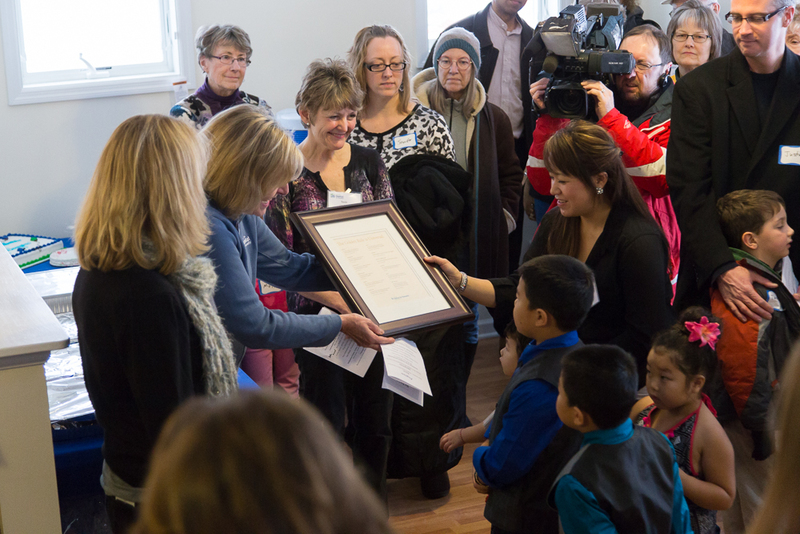 “Community starts right here” as we bring together neighbors and friends to celebrate a family’s new home. Sue Haigh, President & CEO of Twin Cities Habitat For Humanity (TCHFH), acknowledged that First Universalist’s bold endeavor, which integrated time, money, joy, and love, generated the single largest contribution in one year from a church to TCHFH. Sue said, “Love is action,” and recognized the actions of many individuals, community groups, and neighborhood partners who make Habitat’s work possible and who create a critical mass to bring about systemic change. TCHFH Board Member Ann Senn presented the family with a Bible as a symbol of the spirit of the amazing team it took to build the house and with the framed Golden Rule to represent Habitat’s commitment to people of all faith traditions. Click here to see more photos from this home dedication. 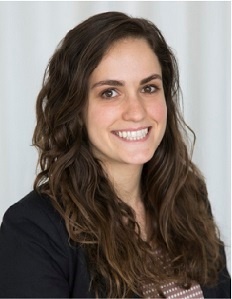 Kaitlyn Dormer rejoined the Twin Cities Habitat marketing team as Communications Manager in September 2017. She has been with the organization since 2014, first as Events Assistant for one year, then as Executive Assistant & Board Liaison. Kaitlyn graduated from the Villanova School of Business with majors in Marketing and International Business and a minor in Latin American Studies. Originally from New Jersey, Kaitlyn quickly adapted to Minnesota and developed her love for camping, hiking, biking, and sweaters.